I've also just found the house where I lived in London back in the early 90s. Nostalgia fest! Last watched: The Man in the Mirror. I've been updating the site with new locations for quite a while, but have only just got round to putting the new finds on the 'What's New' page. Lovely to see the updates. Still the best locations site! Well done, and thanks! And we've just identified some more Avengers locations! Another Avengers location found, but sadly has been demolished - visit the Avengerland site. Lots of new material on the Avengerland site thanks to Mike Richardson's research. Always keep your bowler on in times of stress! How to Succeed... at Posting! Add Marker at the foot of the view to locate the mill in the middle. It is recognisable, I think, with zoom-in (+). The building to the left is Old Mill House, the building below is The Watermill Inn which is open to the public. A new building appears to be being built to the right. Here is a very interesting feature which explains, in a roundabout sort of way, why 'Avengerland' exists, and still exists today. So, is there a plan, where are all Avengers-locations in London are listed? I don't know why, but it's confusing me. Anthony's Avengerland website is the best by far. (Anthony, there's still an old Tripod link on the front page btw). Every episode from 1961 to 1977 plus more trivia than you can shake a brolly at. 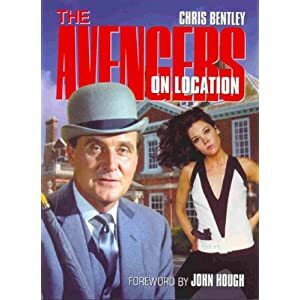 Chris Bentley's book The Avengers on Location is excellent, though it seems to be a bit pricey now. What does there shortcuts like "M15", "N33",... mean? Ah, a new book for me to read. Well, I'll see, if I can get this book for a good price, if it's still available. Now, it's any more easy to understand it. I keep track of my locations using Google Earth. I've not listed most London locatins as they tend to be easy to find streets. PS. Please send details of any defunct or faulty links. I finally got "The Avengers On Location"! Every location is shown in detail. And with "behind the scenes"-picture, I've never seen before. The book will be great help for me. And the discoveries continue - recently identified on the Britmovie forum, the location of Fox, White and Crawley's premises seen in The Fear Merchants. Detective work involving The Prisoner, a Ford van, Google maps and Norman Wisdom led to this being identified as Beaconsfield Film Studios. Interesting - what light did The Prisoner shed? A Ford Thames van which appears in behind the scenes shots of The Prisoner being filmed at Portmeirion is also parked in shot at The Fear Merchants location. It then turned up in a 60s film magazine picture accompanying an article about a Norman Wisdom film being made at Beaconsfield Studios. Another example of the kind of detective work carried out by a variety of people over the years which led the Avengerland site to become the detailed source of information it is today - and subsequently enabled the publication of the Avengers on Location book. Hold the horses! - I'll have to qualify that one - Beaconsfield Film Studios is still just a possibility, I don't think we have any conclusive evidence yet. Powered by PhpBB.BizHat.com, setup your forum now!